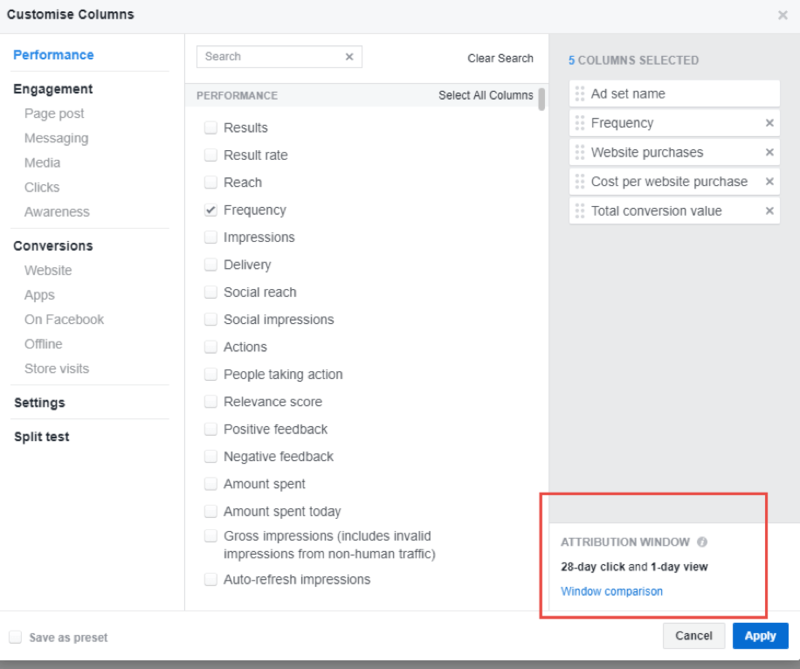 Facebook Attribution is now more important than ever, with Facebook clenching its muscle as the next best acquisition channel. In this blog we will look at Facebook view vs click attribution. One use case for looking at view through attribution is to better understand the channels brand awareness to conversion capacity. Say you are running a Facebook conversion campaign and you have a video ad as opposed to a link ad. With Facebook autoplay functionality users don’t need to click the ad to view it. You may wonder how many conversion are brought in from the video views independent of clicks and whether the campaign has any positive ROI. 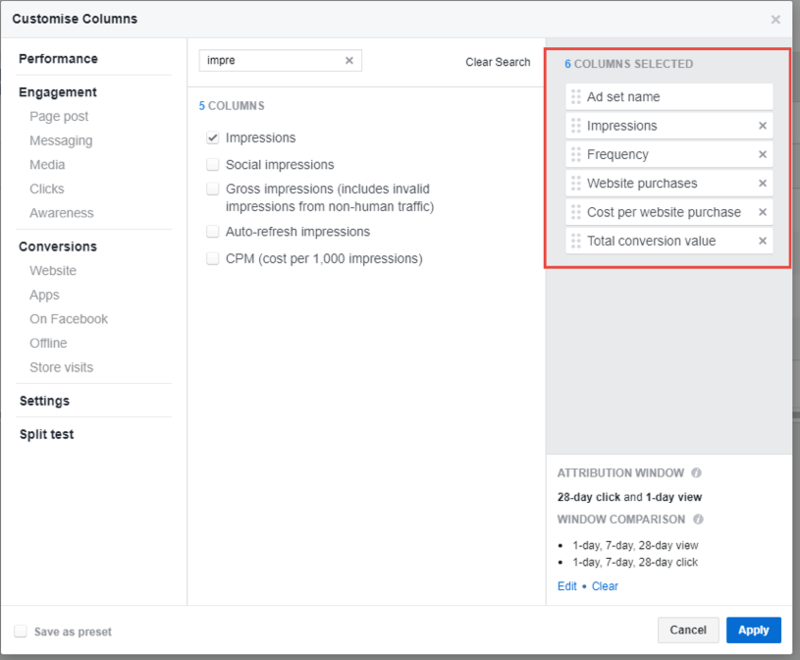 With Facebook View vs click attribution you can do exactly that. Beyond looking at view through attribution you can also compare multiple conversion windows (1, 7, and 28) to better understand user behaviour and advise you frequency strategy. A conversion window is basically the time between viewing and converting. 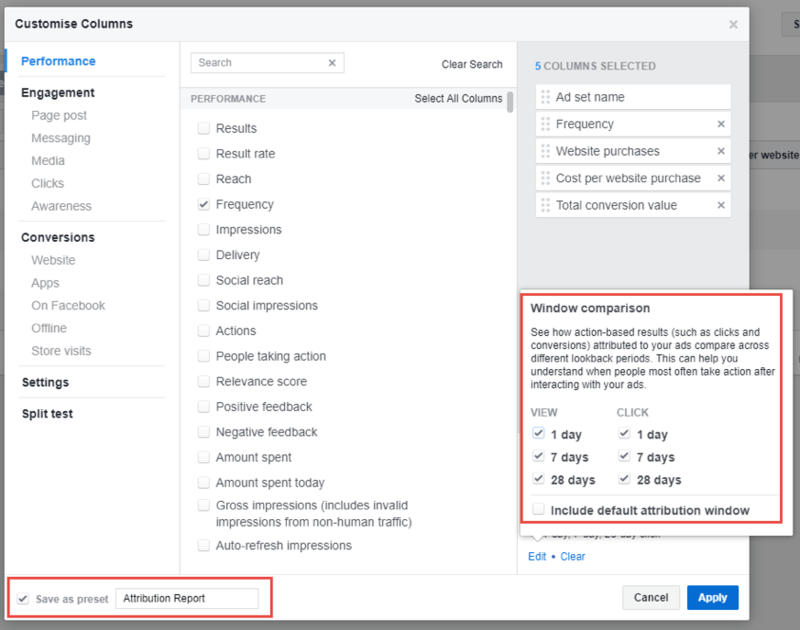 To get started with Facebook attribution, I typically start with creating a custom column report in Facebook and setting up the prefered attribution window. I am doing an analysis on the Ad set level, since I know all my ads are the same across all ad sets. You can do a similar analysis on either campaign or ad level it all depends on what you want to achieve. Let’s assume we want to understand our impression, frequency and attribution performance, I would add impressions and Frequency as columns mapped to Conversions , cost per conversion and Total Conversion metrics (this is an ecommerce site so your metrics may be different). Click on it and choose the Window Comparison you want, I select 1,7 and 18 days and not include default attribution window. It’s just an unnecessary additional column. I then Save the report as an Attribution report, that way I don’t have to do this every time. This is what we get as the final output. It’s a fairly long table so I typically just remove some columns or export to excel. Once on excel, you can calculate impression to view through conversion rates and compare to frequency figures to see if there is any correlation between high frequency and view through conversions. Or you may choose to look at view through conversion contribution to better understand your video performance.